Nacházíte se: Booktook.cz → Odborná literatura → Cizojazyčné → Ostatní obory a další literatura → Laboratory Animal and Exotic Pet Medicine, 2nd ed. 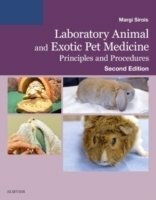 Laboratory Animal and Exotic Pet Medicine, 2nd ed. This combination text and lab manual provides clinically relevant coverage of laboratory animal medicine and procedures. It covers a variety of species, including rats, mice, guinea pigs, hamsters, rabbits, gerbils, ferrets, nonhuman primates, and in a separate chapter, nontraditional lab animals, such as swine, chinchillas, armadillos, reptiles, amphibians, bats, farm animals, and dogs and cats. Coverage of each species is presented in a consistent format that includes taxonomy, anatomy and physiology, uses in biomedical research, reproduction, behavior, husbandry, restraint and handling, identification methods, injection techniques, medication administration and anesthesia, blood collection, common diseases, and euthanasia. Other key topics include the laboratory setting, regulatory guidelines, and ethical considerations. The lab manual portion of the book features a variety of exercises and observation sheets.